This reboot of the video game adaptation is neither better nor worse than the previous one with Angelina Jolie. 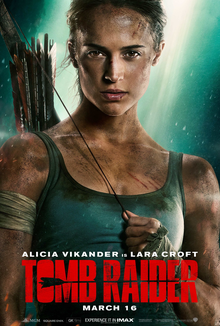 Unfortunately, the story is not very inspiring, but it offers good action (despite the impossible stunts typical of Lara Croft), as well as very nice acting from Alicia Vikander and Daniel Wu. I was quite annoyed by the fact that all the aspects of the supposedly Japanese ancient culture presented in the story is completely bogus and actually looks more Chinese than Japanese. (WTF!?) However, [SPOILER ALERT] I like that the ancient curse turned out to be a disease [SPOILER END]. It offers a nice breath of realism in the movie. Unfortunately, to make it cinematically palatable they had to make the disease’s symptoms completely, absurdly improbable. It is safe to say that Alicia Vikander comfortably slips into the Lara Croft character (despite not having her exaggerated physical attributes which she thankfully compensate with great stamina and charm) and delivers a performance that saves the movie from a complete wreck. The movie received mixed reviews (6.3 on IMDb, 51%/56% on Rotten Tomatoes). All in all, it’s an average action movie that offers brainless entertainment. It’s worth watching, whether you are a fan or not, but only if you have time to spare. Damn! The trailer is showing all the best scenes of the movie!